Parboiled, it is a prime edible mushroom. Uncooked, it can be an inebriant. Uncooked, it can make you vomit. There are many published accounts of Amanita muscaria as the mushroom of shamans and many published accounts of the mushroom used as a recreational inebriant. 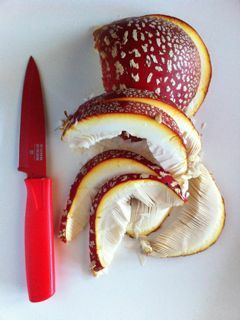 What there are not are many published accounts of Amanita muscaria as an edible fungi, must less as a prime edible. And yet, properly parboiled, that is what it is, a delicious sweet tasting mushrooms. One of the best. In researching Amanita muscaria I’ve found that there is a long tradition of its use as an esculent alongside its use as an inebriant. It is a delicious mushroom, and easy to identify. The way I prepare it is to cut the mushroom into thin slices and boil it in plentiful salted water for about 15 minutes. I then drain it and then use the parboiled mushrooms in the usual ways — dressed with oil and vinegar for a salad, sauteed in olive oil, added to gravy to pour over steak. Ibotemic acid, the active compound in A. muscaria is water soluble, so boiling removes it. The only real warning I’d give you is to be certain there is plentiful water and that you don’t skimp on the boiling time. The following article on the cultural history of the edibility of Amanita muscaria was published in the peer review journal, Economic Botany. I wrote it with mushroom field guide author David Arora (Mushrooms Demystified and All the Rain Promises and More). As we point out in the article, Amanita muscaria is the only terrestrial organism with the pattern of red with white dots. My daughter, Stella, pictured above, was easily able to identify it as a four-year-old. In this photograph at age 5 she and her doll pose with a young muscaria in the mountains above Santa Fe, New Mexico. Mushroom field guides routinely label this mushrooms “poisonous” and some even claim it is deadly. A. muscaria is “poisonous” in the sense it can make you sick or alter the way you perceive the world if not detoxified through boiling. Boiling removes the ibotemic acid, the active agent in the mushroom, rendering it harmless. I became interested in the disparity between the facts of the mushroom’s edibility and the descriptions of it as a poisonous mushroom in mushroom field guides when as a matter of curiosity I started trying to track down proof that the mushroom had ever caused a fatality. While this is another story — I am pretty certain that the answer is it hasn’t. The mushroom first entered modern European literature in the reports of explorers in the early decades of the 1700s when they discovered that peoples of coastal Siberia used it as an inebriant. This came as a great surprise as these Europeans knew about alcohol, brandy, and hashish but had never heard about people using mushrooms. And yet, that is what they found. Unfortunately, from the clear observations of Amanita muscaria being used as an inebriant and from clear reporting that placed A. muscaria on an equal conceptual footing with other known inebriants we finally arrived, after some extraordinary meandering that included scientific experiments in the early 19th century proving it was edible, to where we are today with most mushroom field guides, regardless of culture, listing the mushroom as poisonous, and even deadly. Completely weirdly, even Japanese field guides and web sites list the mushroom as poisonous even though Amanita muscaria is collected commercially in Nagano Prefecture. It is pickled. Given where we are today, with A. muscaria: A case study of cultural bias in mushroom field guides’ determination of edibility so often identified as dangerously poisonous, it really is amazing how much work went into testing the mushroom in a laboratory setting in the 19th century and how widely accepted was the conclusion it was edible if parboiled. The French 19th-century experimenters took the approach that there are many foods that are widely eaten, like cassava, that are injurious if not processed, so they asked themselves, could they figure out how to process A. muscaria to make it edible? The answer was yes, and as I describe in the Economic Botany article, this yes was widely accepted until the early 20th century when suddenly, for no apparent reason, it was rejected with prejudice but for no scientific reason. What this suggests to me, and this is a major focus of the Economic Botany article, the edibility ratings in mushroom field guides are not strictly speaking scientific. They are more ethnobotanical classifications and do vary between cultures, bearing in mind, of course, that there are mushrooms that are deadly poisonous and can kill you. While Anglo-American mushroom culture never boils mushrooms, in fact there is a deep and widespread tradition of boiling mushrooms to both improve texture and to remove toxins. For example, boiling to remove toxins is a common practice in Finland where yellow staining Lactarius are eaten after multiple boilings in plentiful water. Russula emtica, a mushroom whose name suggests what happens to you if you eat it, is in fact a prized edible in large parts of Russia where it is picked and pickled. The processing into pickles neutralizes the toxins that would otherwise make it a poor food to choose when sitting down to a bottle of vodka — the traditional pairing. The Amanita muscaria is one of the most beautiful mushrooms that there is. It is a pleasure to find, easy to identify, and good to eat when properly prepared. This said, the basic rule of mushroom collecting always is, “In case of doubt throw it out.” And another basic rule, one that as yet isn’t part of rhyme, is that one should never eat a mushroom one isn’t comfortable eating. If you decide to eat A. muscaria, then start with a quarter of a cap thoroughly boiled in that plentiful lightly salted water. As the standard dose of uncooked caps for adult men eating them to get inebriated is one to two caps it is obvious that 1/4 cap well boiled can do you no harm. Build up your confidence in small portions. Do not eat a big plateful the first time, then become panicked that you made a mistake, and then start to feel your stomach is cramping up. Start slow and build a sense of confidence. Pingback: How much amanita muscaria to eat? I thoroughly enjoyed this article on Aminita muscaria. I read the lengthy extended part too. Proper words escape me at the moment to adequately describe my appreciation for all the research done on this beautiful mushroom. When I was a little girl in the early fifties, my dad used to take me with him for walks in the woods in the rural areas of my neighborhood in southwestern Pennsylvania. He taught me how to find wild plant foods like walnut trees, blackberries, crab apples, peaches and mushrooms. At the time I hadn’t developed a taste for mushrooms, but I was always impressed with his simple knowledge of how he “knew” what was okay. I trusted that. He used to also take me fishing with him in nearby reservoirs and streams. My, my, I am reminiscing as I write this. Anyway, I do enjoy mushrooms as an adult and am very curious now about these wild varieties. I also feel that too many of us in our untrusting and faithless fearful society have replaced gut wisdom and common sense with believing in much of what we’re told by the so-called experts in the field who really are not such experts. This is sad. Thank you again for this well written article. I love the Amanita, so I have to say that I liked the article. I’ve done a lot of research into this great mushroom so I’d like to raise a point or two about it. First, I was under the impression that Muscimol was the active ingredient and the Ibotenic Acid in it was a bad part that needs to be removed or avoided. Its alleged that ibotenic acid when combined with carbon dioxide from any carbonated drink can cause brain damage and its never recommended to eat it fresh. Allegedly, the amanita can have hugely beneficial healing qualities (anti fungal, anti virial, anti bacterial) when its eaten after being dried thoroughly. A popular way to do this in the past was by putting mushroms over the fireplace in socks of the same color of the mushroom. The ibontenic acid goes away with the water when dried, leaving a god send of healing power behind. I do not know about combining ibotemic acid with carbon dioxide so I cannot comment on that. Many people feel that many mushrooms have healing properties. There have been no tests in mainstream medicine regarding A. muscaria and healing properties so, again, I cannot comment. I can say, though, as I point out in my article, that drying the mushroom intensifies its psychoactive properties so if you or any readers intend to ingest the mushroom for its psychoactive properties be sure not to overdose yourselves by increasing the dose ingested because the dried material seems so little. Drying doe not make the ibotemic acid “go away” as in vanish leaving no tract. It helps convert it to muscimol. You can only detoxify the mushroom by boiling in plentiful water an throwing the water away. Some people, to be super sure that their A. muscarias will be good for eating at dinner boil them in two changes of water. ” poisons” be carried through to the veggies which have been composted? No. Put them in the compost pile. You won’t be eating the dirt!